Lorca, one of history’s greatest playwrights, was brought to ISP. His play Bodas de Sangre was given life to by our students under the direction of Karen Massieu. I was lucky enough to be part of this production. 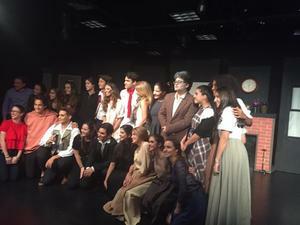 Fortunately, the text used is frequently taught in Spanish IB classes, so students within the audience and cast already had a relationship to the play. Through this exposure, they will be able to reflect on their educational experience on a level unavailable to those who haven’t had a performance available to them. Bodas de Sangre is a brilliant romantic tragedy. It touches on all forms of love, from a mother to her son, to unrequited love, to romantic love, and how we as a society fail to protect it. Through it, we get to understand the values and cultures of early 20th century Spain, like Markus Kempin (who interpreted Leonardo), states, we get to see “how much materialism was associated with marriage at that time and how honor was a very decisive force.” Lorca created this brilliant tapestry of turbulent emotions that students sewed together in front of the audience. The cast was able to bring the old and dusted text to our reality, to a reality we can use to comprehend and understand today’s reality. Gabriel Juarez won over the audience’s sympathy as the Novio, the grave injustices brought onto him because he loved a woman who could never love him back. Markus Kempin as Leonardo and Paloma Manterola as the Novia’s impossible love story cradled and broke the audience’s hearts. And I can only hope that my portrayal of the Madre and the tragedy of the constant death surrounding her managed to strike a chord in the audience’s emotions as well. Regardless of this being a play from 1935, our portrayal allowed audiences to connect to it and contextualize it within our 2019 reality. This play, however, did not appear from thin air, but as a result of arduous work from cast and production since October. This was a huge time commitment, and it is was a challenge in itself for students to balance it with their academics. The cast has been rehearsing constantly, having to memorize complicated dialogue. It was also many people’s first time delving into the world of theatre, which made it an all the more complex rehearsal process. Gabriel Juarez learned, for the very first time, “how to put myself in the shoes a theatrical character, to feel like them and transmit the effect of said character in the plane.” Ms. Morchosky helped coach actors alongside Ms. Massieu’s direction and saw a remarkable development of their characters and their skills. In January, production members began working on setting up the play, under the guidance of Paula Villareal. Leading up to the play constituted of various weekend rehearsals, long hours rehearsing the play, painting the set, picking costumes, etc. Students learned as Paloma said, “a lot, not only about the play, but about the world of theatre… I was able to explore all the different fazes that join together in the end to create a play.” production is nothing but proof of the success that collaboration can bring. Bodas de Sangre has left an important legacy at our school. Through exposure to Lorca’s work, our community became infinitely more cultured, aiding our international school’s community’s duty to being globalized. To Juarez, it was an honor to “speak the words of such a well-known playwright.” It is a whole new branch of theatre that our ISP theatre community is not often exposed to. One of the main goals of this production, as Markus puts it, is “to get people to appreciate theatre in Spanish,” which we, unfortunately, are not often exposed to within the ISP community. Additionally, for the very participants in the production, it will leave an everlasting impact on their experiences in ISP. For many, it was their first time acting and has opened up endless possibilities in their future. Mimi believes that because she took “the risk to act for the first time, it gave me the confidence to talk in front of people, which I used to be scared of… it will definitely help me in the future.” Through their participation, they were able to form everlasting relationships that would not be present were it not for this play. There will always be a footprint in ISP’s pavement set by this play and all it has left in its wake. So what is next for Spanish Drama? Well, you. You, the students, define what happens next. Your participation is what allows Spanish Drama’s heart to keep on beating, and so it is your job now to embrace next year’s production with open arms. As Mimi Yanes, who portrayed the Vecina, perfectly phrases: “I hope that Spanish Drama keeps growing and people continue to participate because it is an amazing experience and you won’t regret it.” Do you have any specific ideas to contribute? Any suggestions? Talk to Ms. Karen, and maybe you’ll be able to help keep this wonderful program alive.